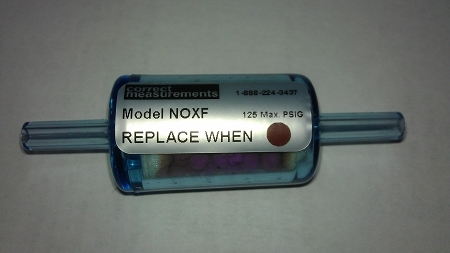 The compact but important filter is designed to install inline on the probe and hose assembly of most brands of combustion analyzers that do not have on-board NOx filters for their CO sensors. Color coded beads well tell you when to replace it. Fits most Bacharach combustion and CO analyzers. The material in the filter enables the meter to correctly measure Carbon Monoxide (CO) without the additional "false CO" of cross-sensitive interference acid gasses, including NO, NO2 and SO2. Learn more about the importance of NOx filters in this two page paper posted on our blog.Click HERE for the Bacharach guide to installing the filter. 40 TruReward$ points will be placed in your account when you buy this item.